Treum: Nutella sita in magno barattolo (magno barattolo sì, sed melium est si magno Nutella IN barattolo). How nice it was when the world was split in half, on this side Nutella, on the other side Ciao Crem (another brand of chocolate-hazelnut spread, popular in Italy in the 80's). And it was so easy to choose. Let's be frank, Ciao Crem has all my respect; after all it did its best desperately trying to differentiate itself with two flavors of different color, chocolate and hazelnut, mixed together in the same jar. And yet, despite the slogan Two Flavors: Two Kisses, Nutella has always remained the queen of afternoon snack, first promising energy to do and to think (popular 80's slogan of Nutella TV commercials) with its supposedly simple and natural ingredients; then cheering up the Nutella Rave Parties of our teenage years when, spread on top of giant slices of baguette, it was bore shoulder-high around the building (again, it was a scene from another popular TV commercial); and finally being packaged in reusable glass jars, that would pile up with no shame to bear perpetual memory of our addiction. At home back in Italy we even had a 20-pound jar, which was sitting on the shelf in front of everybody. It was the Social Nutella, and whoever came in could not resist its call. Maybe it was because of the enormous proportions of the vase, or maybe it was the logo NUTELLA written in an extra large font, I don't know. The fact is that this maxi package would bring back primordial instincts and sooner or later everybody had to experience the thrill of sinking the spoon (when it was not a ladle) in a big ocean of Nutella, one where you couldn't see the bottom. Pass the bread, please. Or maybe the slice of panettone, since we are at Christmas time. But be advised, I don't guarantee on the side effects. sunflower seed oil (or other neutral tasting oil) 90 ml. The recipe is based on Elena di Giovanni's one, which has been posted many times on the Cucina Italiana online forum, and which has also been published by Paoletta, here. But I've used milk chocolate instead of dark one, in order to get a result closer to the original, even if maybe it's less satisfactory for those chocolate purists. And I've adjusted the quantities accordingly (in short, more hazelnuts and less sugar). Toast hazelnuts in the oven, let them cool down, and then eliminate their outer skin. Put them in a food processor with a little bit of sugar (taken from the total amount) and grind them finely. Chop up the chocolate. Pour all ingredients in a pan with heavy bottom, place it on the stove at low heat, making sure the spread doesn't warm up too much. As soon as chocolate is melted, use an immersion blender to grind the hazelnut grains as fine as possible. Cook for 3 or 4 minutes longer, always stirring, until the spread is smooth. 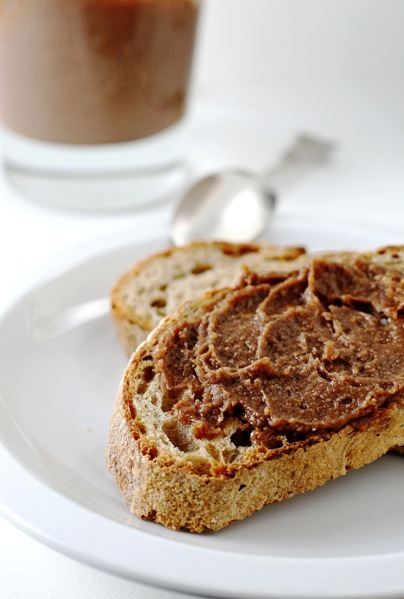 Pour the Nutella-like cream in the jars when still warm, and let it cool completely before sealing them. now you got me craving Nutella!!!! If you come visit me, I'll give you a jar!